Amelia by Rainbow Club. 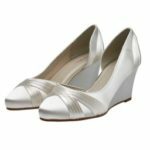 A sassy high peep toe court shoe with scattered ivory blossoms. Last pairs size 5 and 7, wont be restocked.